“Hi I’m Maya Weintraub from Los Angeles, California! I decided to take a gap year because I didn’t feel ready to go to college. I wanted time away from the pressure of school to explore myself, my interests, and Israel. Aardvark has allowed me everything I have wanted to accomplish while on my gap year. 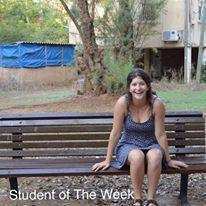 I started in Jerusalem on the Selah track doing religious learning in the mornings and when we came to Tel Aviv I began my internship at a small business.